A couple of weeks ago we discussed repainting the outside of the firebox to restore it like new. It’s also possible to clean the inside of the firebox as part of a restoration project. 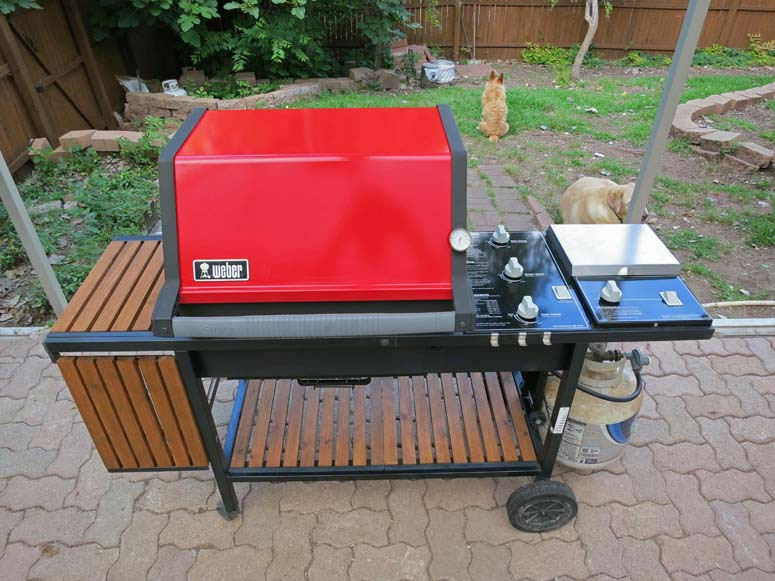 Assuming that you give your grill a thorough cleaning once or twice a year, there’s little you need to do to maintain the inside of your gas grill firebox. Just brush any loose material with a stiff bristle brush or scrape it with a putty knife and you’re good to go. 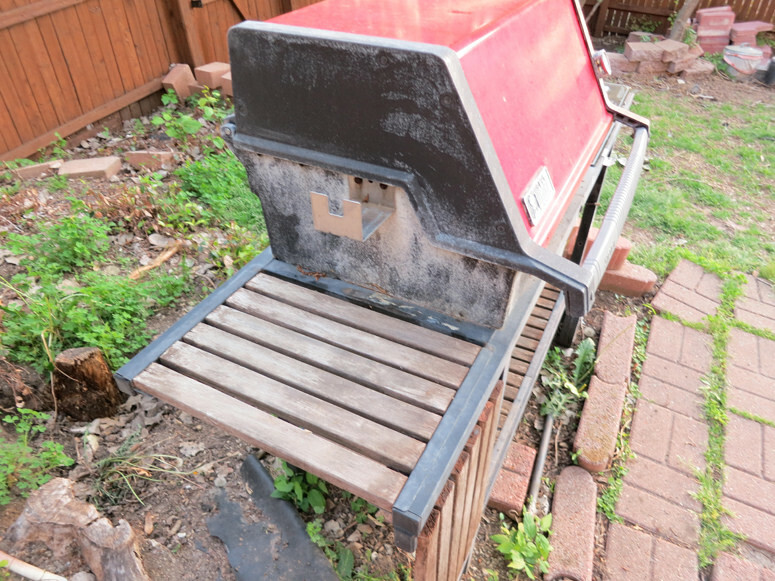 But if you’re restoring an old, abused grill, you might want to do a deep cleaning. Enter an angle grinder and a cup wire brush. 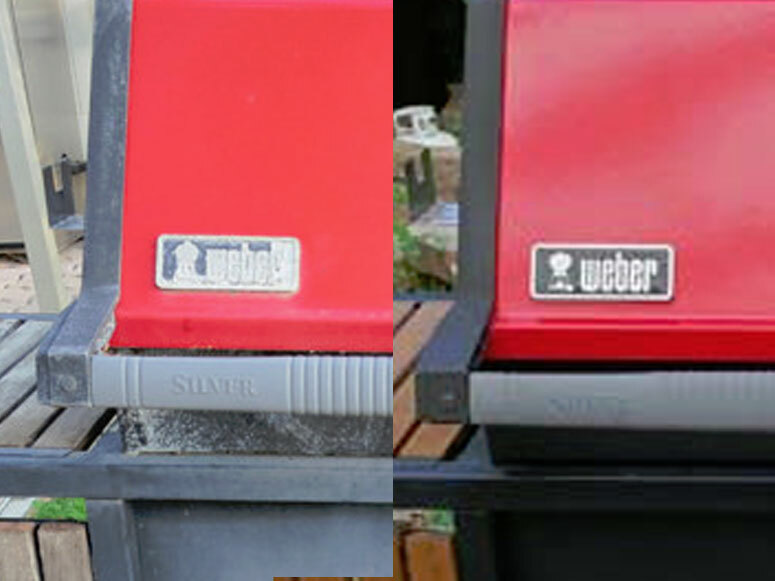 That’s what TVWBB member AnthonyJ used when restoring the Weber Genesis Silver C shown in these photos. 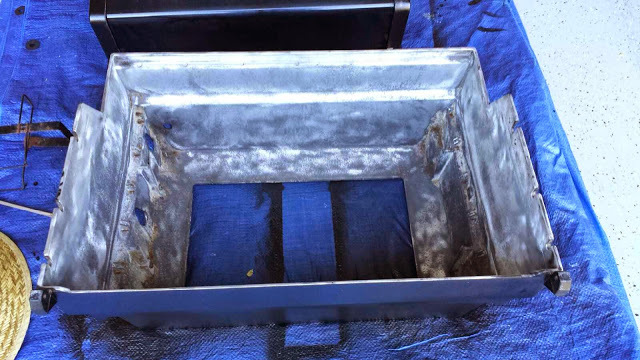 Anthony removed all the parts inside the firebox and removed the firebox from the frame before cleaning the interior with that powerful wire brush. 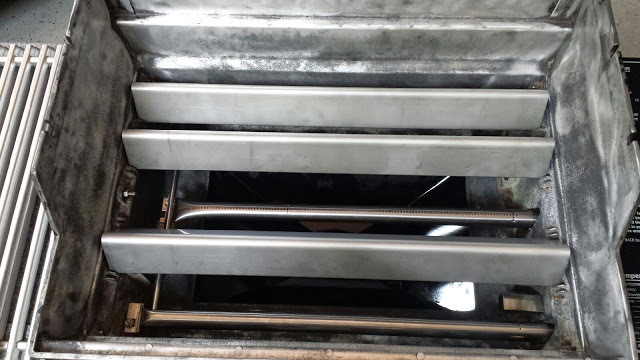 This photo shows the firebox back on the grill frame, with burner tubes, igniters, and stainless steel Flavorizer bars going back into the firebox. 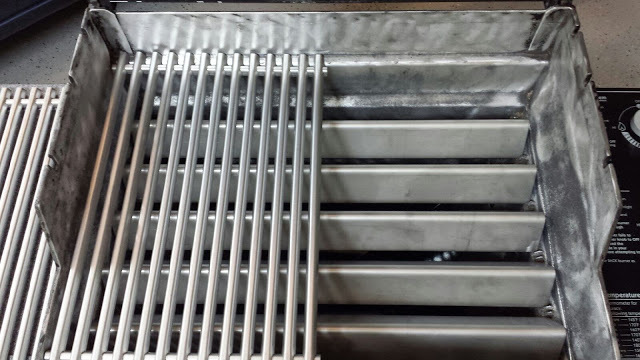 New stainless steel grill grates complete the restoration. Weber Genesis Silver C ready to go back into service for years to come. You can read more about Anthony’s restoration on The Virtual Weber Bulletin Board. 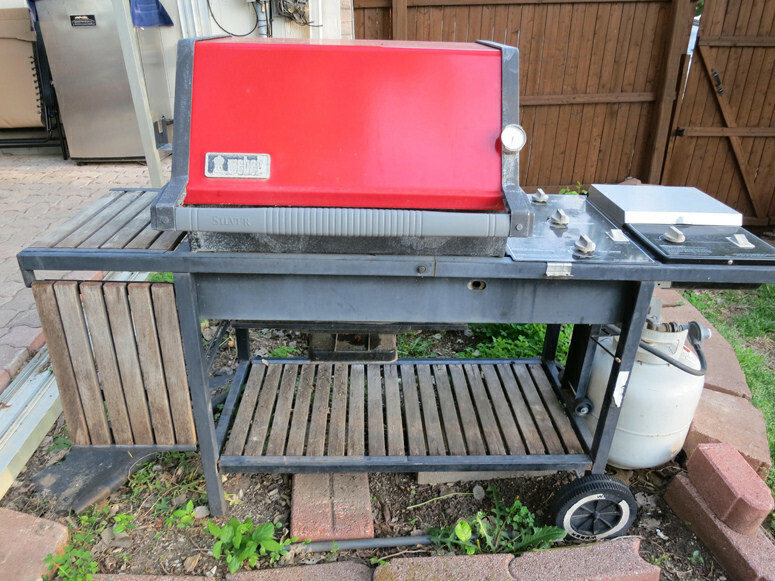 Weber gas grills are notorious for flaking, peeling paint on the firebox. 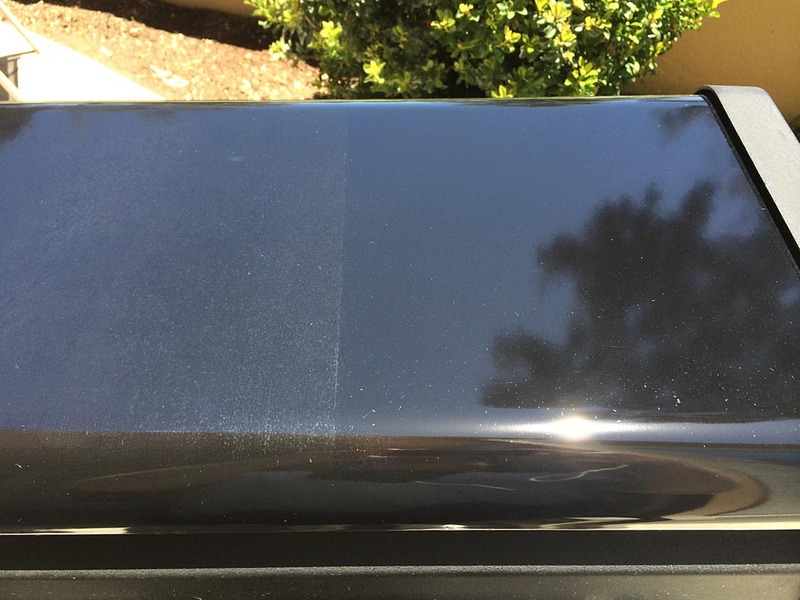 The gas grill warranty covers the paint for two years, which is about how long it takes to start flaking and peeling on your grill! But to be fair, the firebox does get very hot and paint is no match for those high temperatures. So what to do? You repaint the exterior surface yourself. You do not repaint the interior. The process is pretty straight-forward. Start by using a wire brush to remove any loose paint. 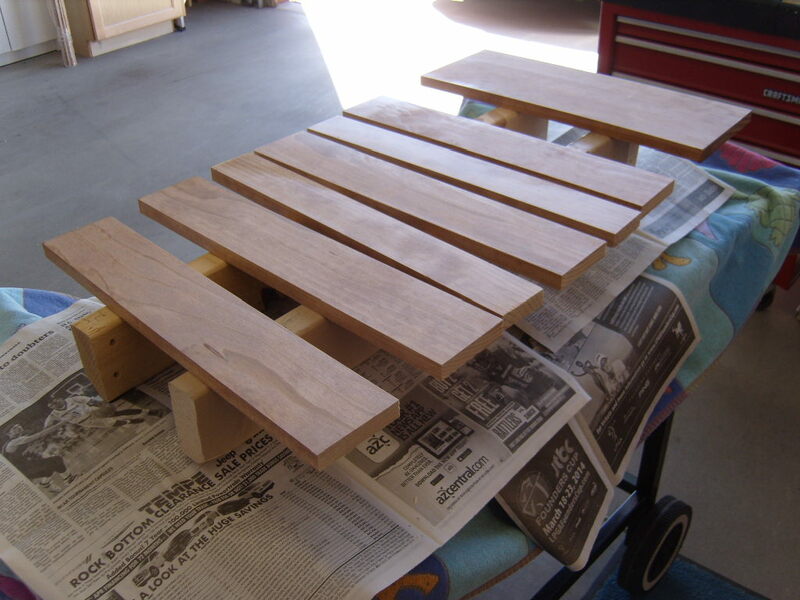 Hit the flaky spots with fine-grit sandpaper to make them ready for painting. You don’t have to remove the firebox as shown here…this is part of a full-blown restoration. You can simply mask-off the surrounding surfaces with newspaper and masking tape and paint in place. 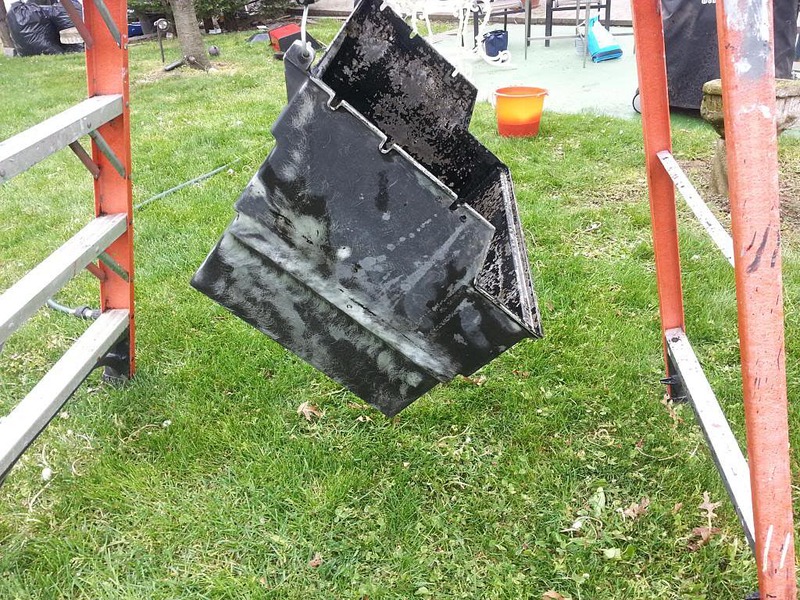 Use flat black high-temp spray paint to repaint the firebox. Two thin coats of paint is usually better than one thick coat. Depending on your particular grill, you can even repaint the lid end caps using the same process. The results are pretty satisfying. 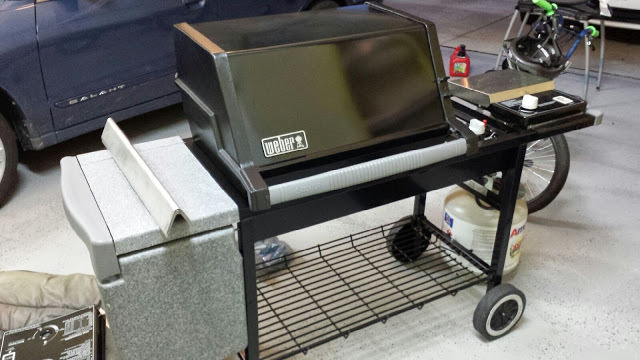 A fresh coat of black paint will make your Weber gas grill look good as new. 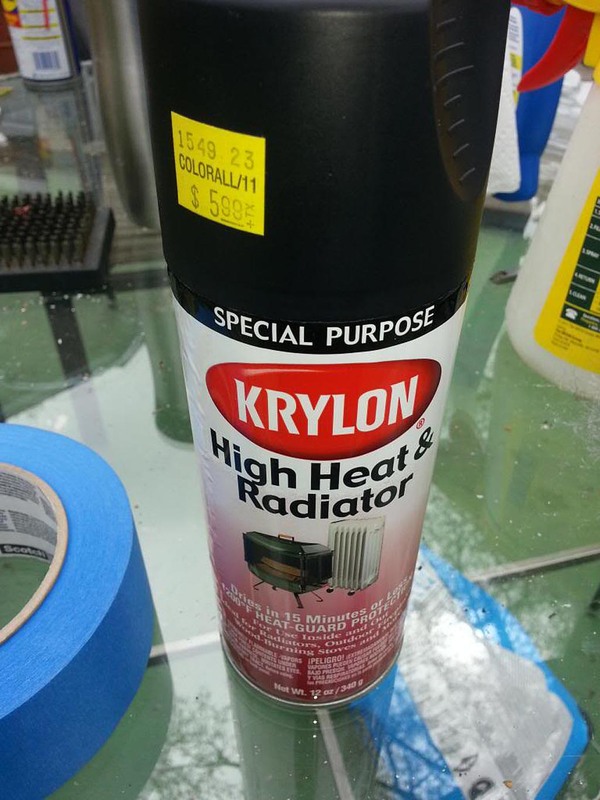 Just remember to save that leftover spray paint…because you’ll be repainting again two years from now. 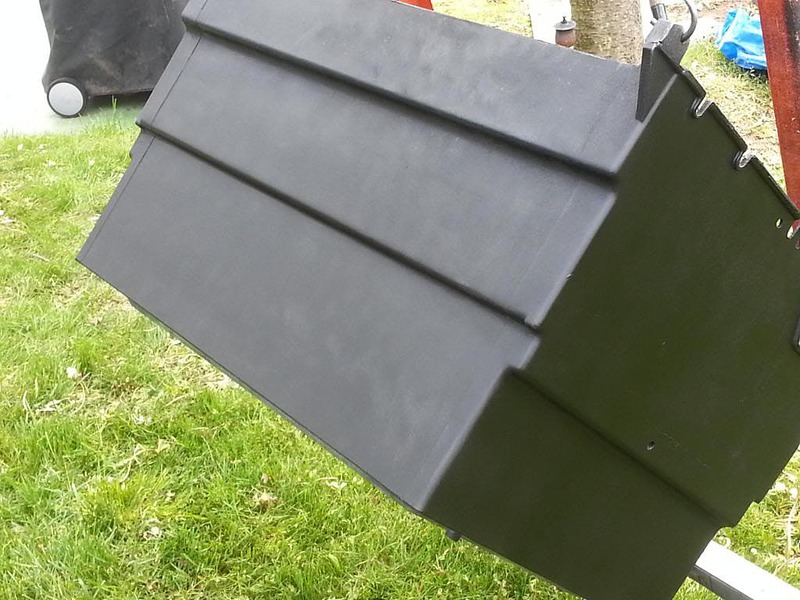 These photos are from a 1992 Genesis 1000 restoration by Bob U. You can see more photos of this restoration on The Virtual Weber Bulletin Board. 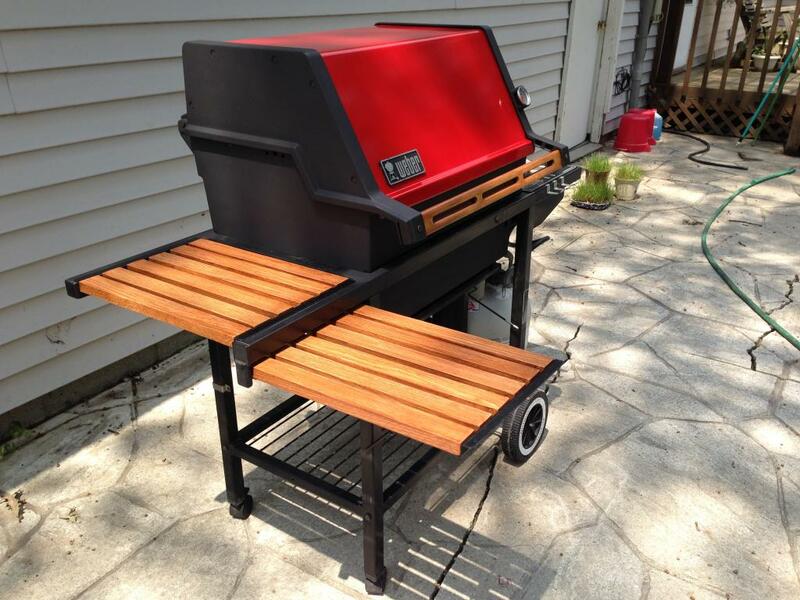 A popular technique for cleaning exterior porcelain enamel on Weber grills, both gas and charcoal, is to use super-fine 0000 steel wool and a degreasing spray like Simple Green or Formula 409. 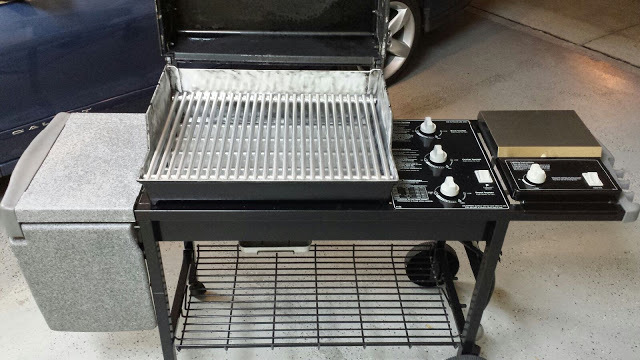 You can use this technique to occasionally deep-clean your grill or to restore an old grill to like-new condition. Use a damp cloth to remove any surface dirt. Spray degreaser generously on the surface. 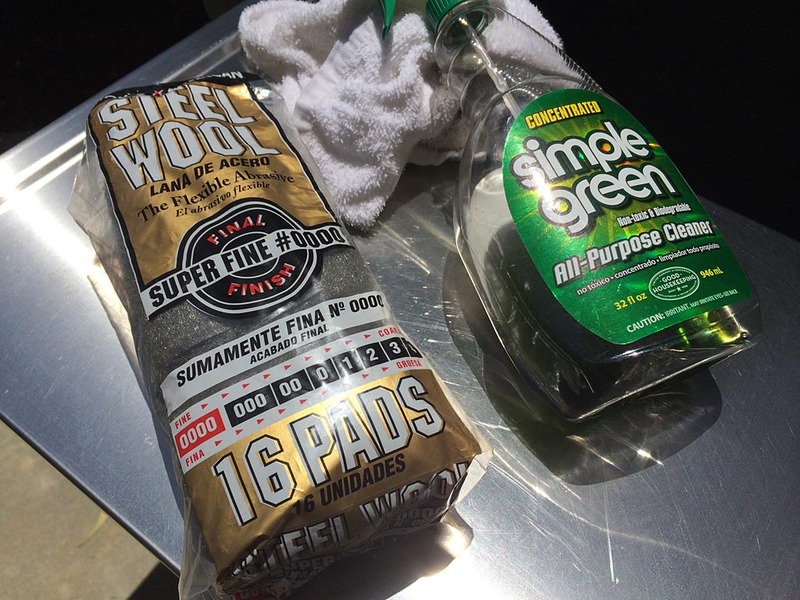 Using a circular motion, scrub gently with super-fine 0000 steel wool to remove grease build-up. Apply more degreaser if it begins to evaporate. 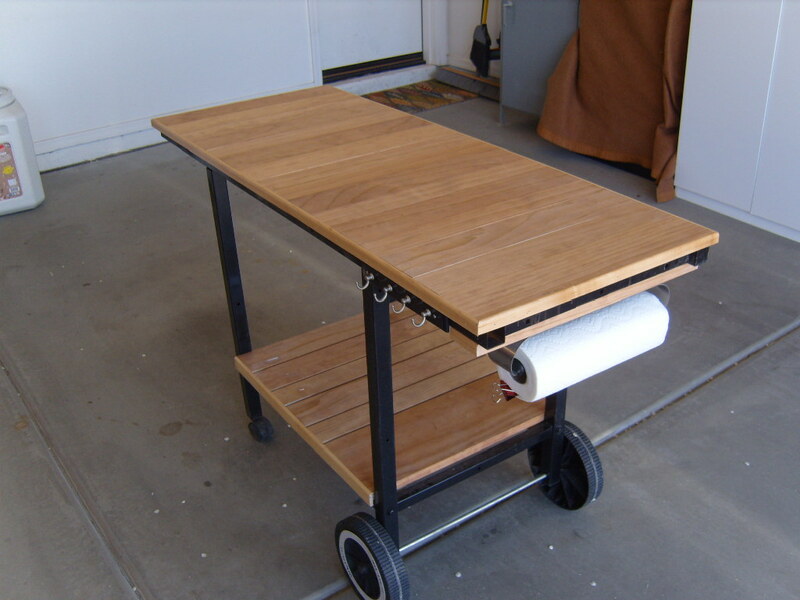 Wipe away residue with a damp cloth and check your work. Repeat Step 2 if some areas are still dirty. 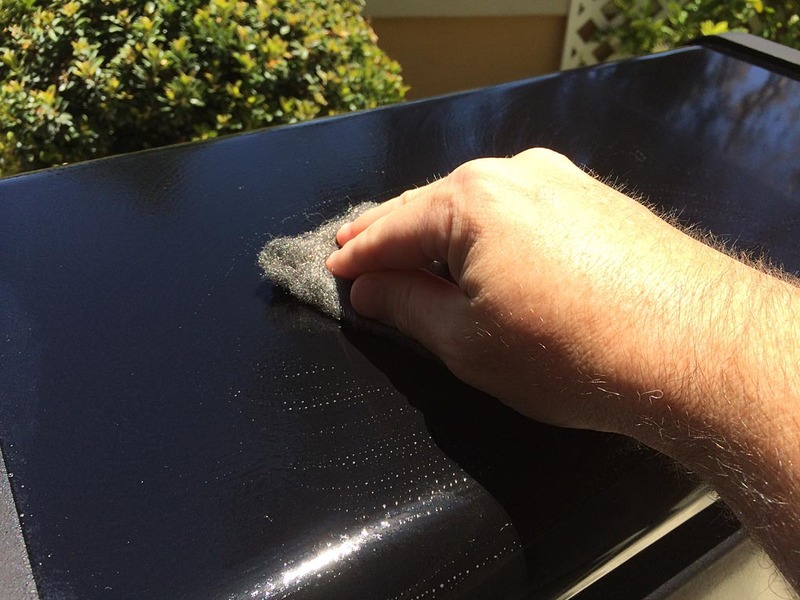 Wipe the surface several times with a clean damp cloth and dry with a soft towel to remove streaks. Thanks to countless members who have shared this technique on The Virtual Weber Bulletin Board. 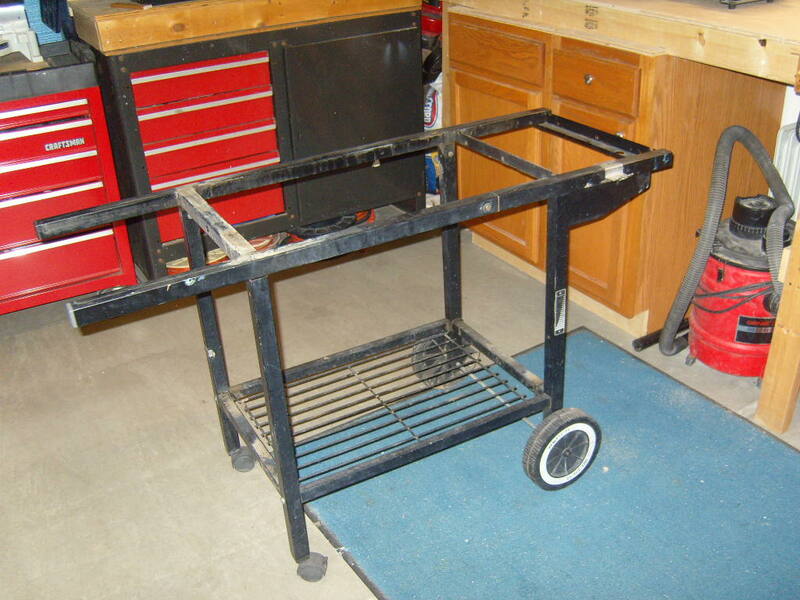 TVWBB member Rich Dahl made a wonderful grill cart from an old Weber gas grill frame. 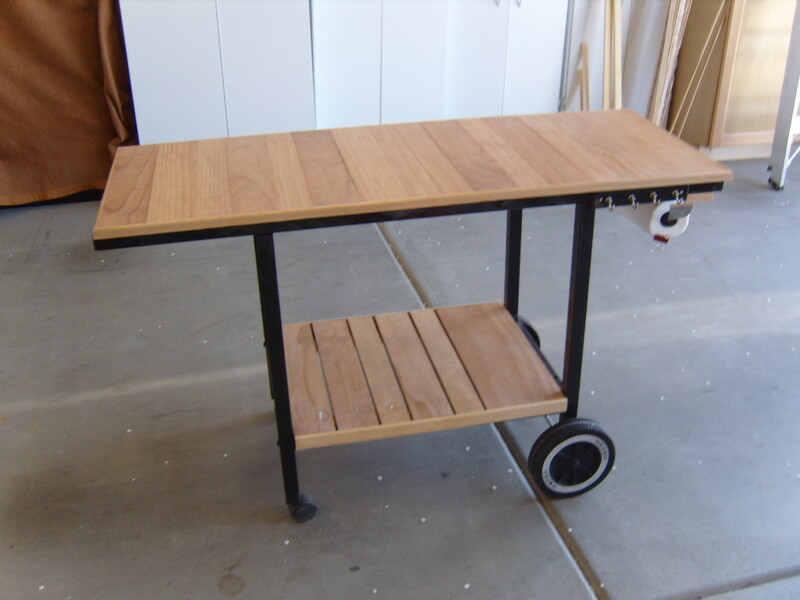 “I was looking around for some type of movable service cart for my cooking area and just didn’t find what I wanted, or the price was way out of line,” says Rich. 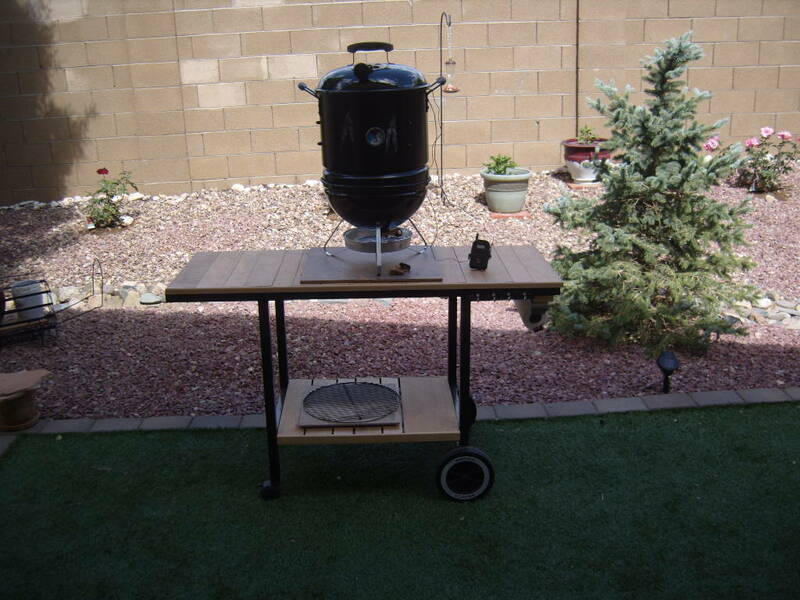 “I was on Craigslist one day and ran across a Weber Silver B gasser for $20.00, pretty beat up, but being in dry Arizona, no rust at all. I bought it, and with a repaint and some surplus clear pine and some trim, I built my own. Read the reactions to Rich’s project on The Virtual Weber Bulletin Board. 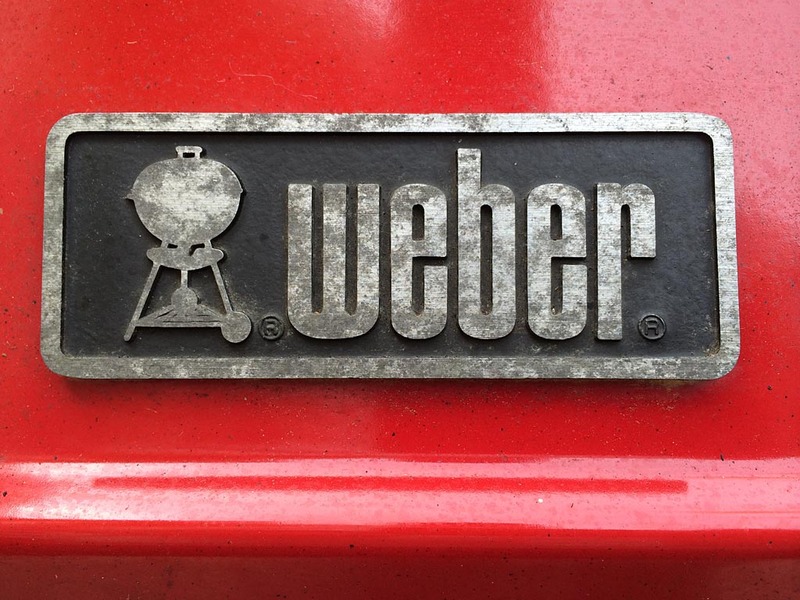 The emblem on many Weber gas grills may shows signs of aging long before other parts of the grill. Here are the steps to restore the emblem to a like-new state. Remove the emblem from the lid. It may be fastened with nuts or friction clips. 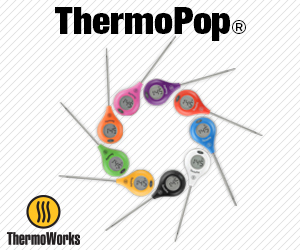 If clips, work them off from inside the lid using a small straight blade screwdriver and needle nose pliers. 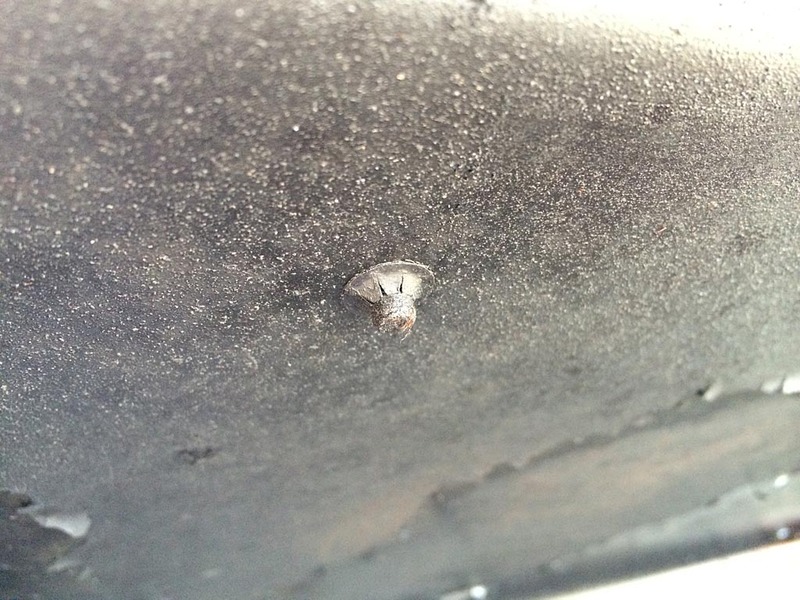 Use a stiff wire brush to remove any flaking paint. Clean the surface with a solvent such as lacquer thinner. Sand the emblem to remove paint from the raised surface, leaving black paint in the negative space. Place a piece of 100 grit sandpaper on a flat work surface and place the emblem face-down on the sandpaper. Move the emblem in a circular motion to remove paint. Check the emblem frequently. Don’t sand more than necessary to remove paint. Repeat with 150 grit, 220 grit, 320 grit, and 400 grit sandpaper until a smooth finish has been achieved. Reinstall the emblem and enjoy your handiwork! 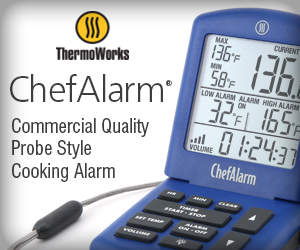 In some instances, the black background may be in good shape, as in the example shown below. This emblem just needs a good cleaning followed by sanding. 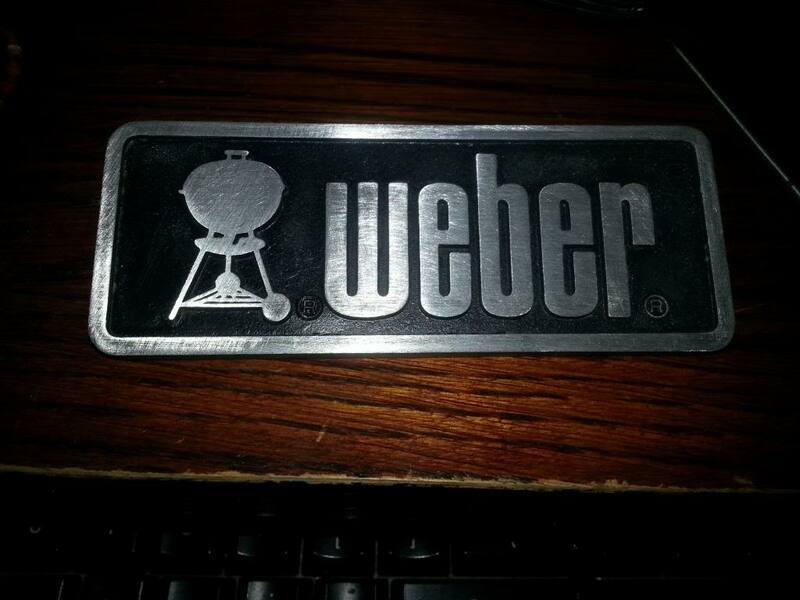 Thanks to members Steve Counts for the before/after photos, Bob U (Queens) for the partially sanded emblem photo, and Chad Bman and LMichaels for sharing the restoration steps on The Virtual Weber Bulletin Board. 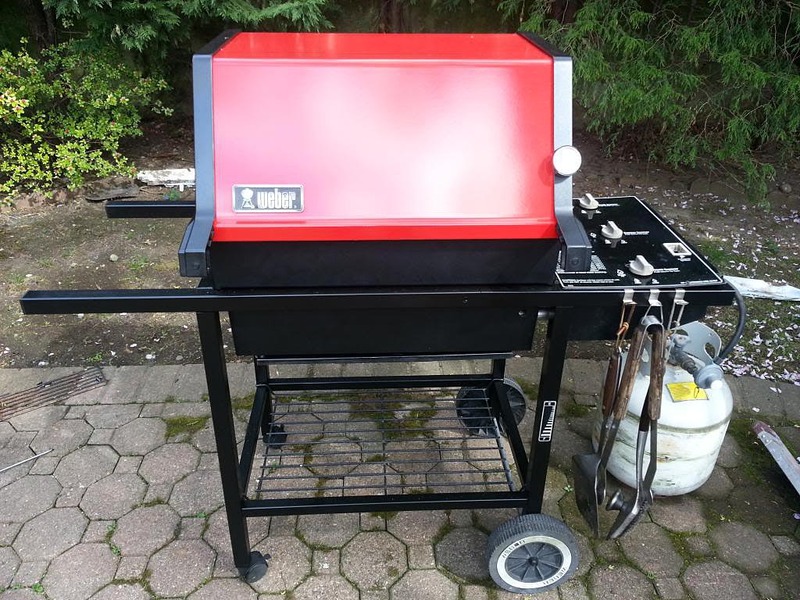 This Weber Genesis 2 redhead is owned by TVWBB member Steve Counts from Richardson, Texas. Steve bought it new in 1992. 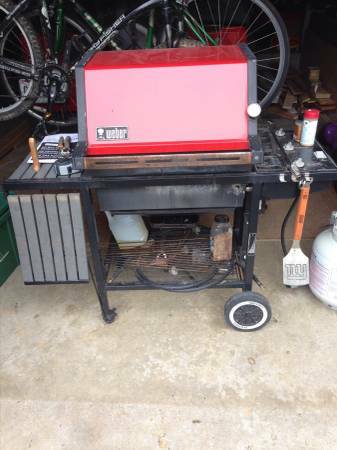 At some point he added the optional side burner and later the casters. The plastic lid handle shown here is not original and was part of Steve’s restoration project. Steve did some deep cleaning, repainted the firebox, replaced some rusted bolts in the frame, and installed that new lid handle. “One of these days I would like to get a wooden handle for looks, but the plastic one from Weber is functional,” says Steve. The Flavorizer bars had been replaced in recent years, so they stayed. 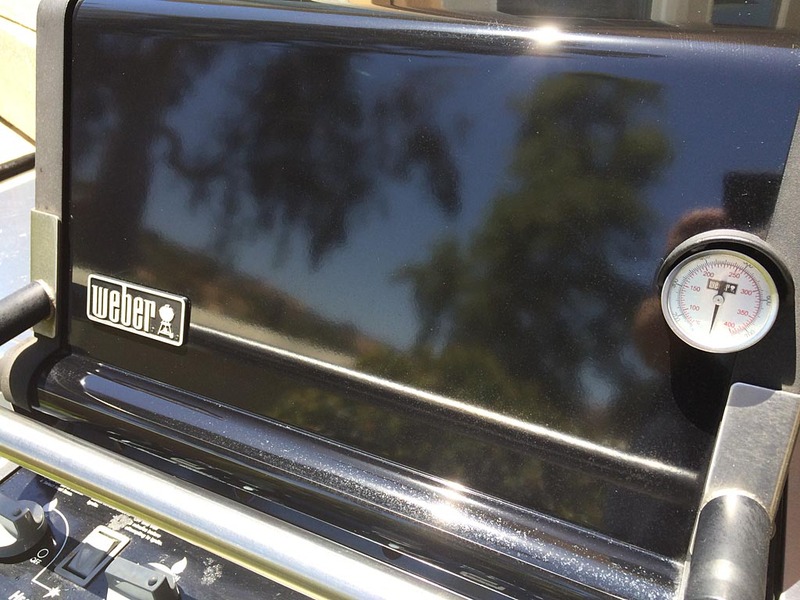 As finishing touches, Steve replaced the burner control knobs and cooking grates, restored the Weber emblem, and created a new gas gauge label using a Brother P-Touch label printer. 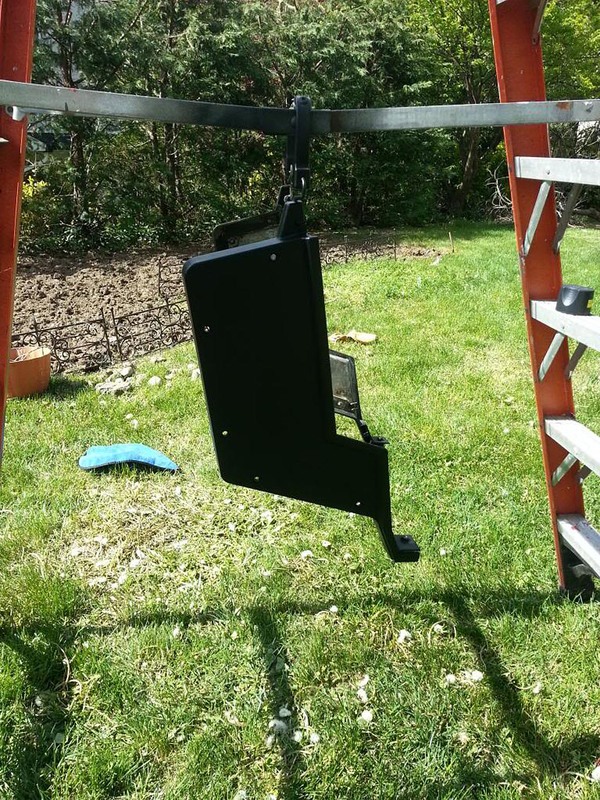 Steve comments, “I haven’t repainted the frame, just cleaned and polished it with Soft Scrub to remove oxidation. Congratulations, Steve. She’s a beauty! 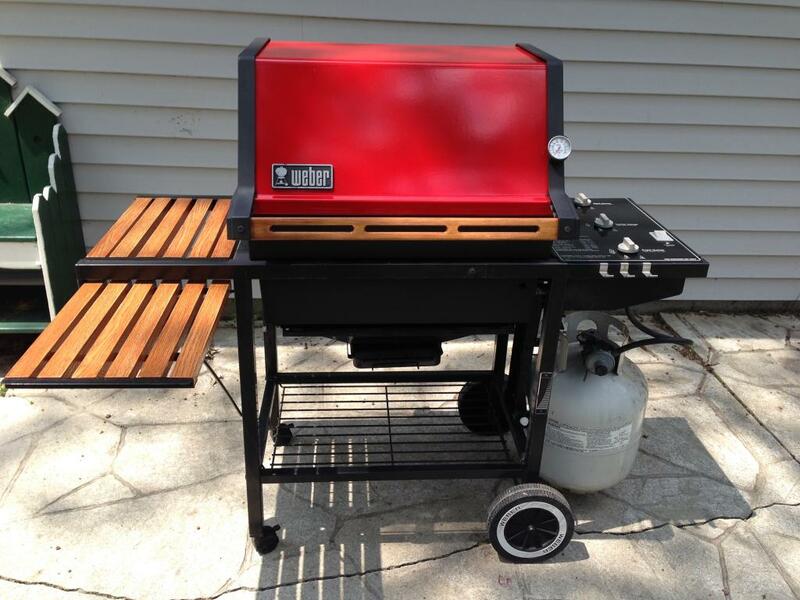 You can read more about Steve’s restoration on The Virtual Weber Bulletin Board.